Many of you know I have a niece who has been a reluctant reader in the past. After reading The Gateway Chronicles by K. B. Hoyle, she has found she loves books. Now, we are trying to find books that she will like so she will keep reading. So on Twitter one day I asked for recommendations. John Forrester responded and offered to send me an ebook copy. 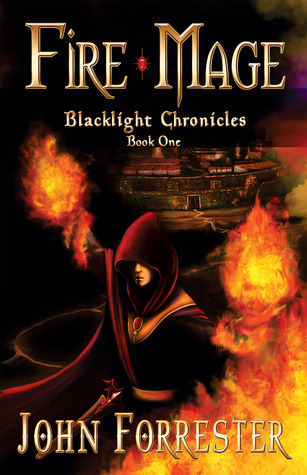 I read Fire Mage in a week. It is fast paced - you jump from action scene to action scene with little downtime. The writing was superb to the point that I would often forget I was reading a middle grades book. Before I even got to the end I knew I needed the sequel. I knew this story would be a winner with my niece (and hopefully my nephew, except he is all about graphic novels right now). I purchased paperback copies thinking they would read them this summer with my mom. A bit to my shock a few weekends ago, I see my niece reading it and about halfway through it. It only took her a week to read it and this weekend she had already moved on to Sun Mage (but I made her promise me she wouldn't tell me what happened because I haven't had the chance to read it, yet). So what did my niece have to say? But in all honesty I wondered if it was more like the battles in rhe Colosseum. As I did picture the city to be a lot of stone and brick, much like I imagine the ancient Romain Empire. I was a little confused about the world they lived in. It was written for younger kids, so maybe they don't question the laws and physics of fantasy worlds like I do as an adult. My niece apparently had no problems just accepting it was the way the world works. It was a fun read that will leave you questioning loyalties and maybe rooting a bit for love. Voting begins today for the Independent Book Blogger Award at Goodreads.com. If you enjoy my reviews and other posts, I would appreciate you taking the time to vote for Girl Who Reads. That's why i read these kinds of books too so i can bond with my son. I'll tell him about this series.